A Nepalese sherpa has broken his own record for the most successful climbs of Mt Everest by scaling the peak for the 16th time, officials say. 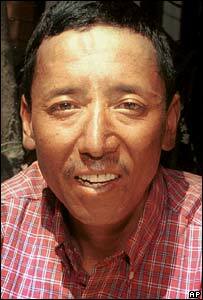 Appa Sherpa, 45, reached the 8,850m (29,035ft) peak while he was guiding a team of international climbers. He reached the peak at 1100 local time (0500GMT), the president of the Nepal Mountaineering Association (NPA) said. More than 1,400 people have climbed the peak, the world's highest, since the first successful attempt in 1953. More than 180 have died while attempting to reach the summit. "He has broken his own record and has achieved yet another historic feat," NPA president Ang Tsering Sherpa told news agency AFP. Sherpas, local Himalayan tribesmen, have been used as guides and porters by mountaineering teams climbing Everest. Appa's record-breaking climb comes in the middle of the brief Everest climbing season. Nepal's tourism ministry said 90 people - 44 foreign climbers and 46 sherpas - had climbed the mountain so far this year. Two climbers and three sherpas have died in unsuccessful attempts. Appa first climbed the mountain in 1989. He has used the money from each ascent to feed his family and put his four children through school for the rest of the year. He had come out of retirement in 2003 to climb the peak again for the 50th anniversary of the first climb. Mt Everest was first climbed by New Zealander Sir Edmund Hillary and Nepali sherpa Tensing Norgay on 29 May 1953.